If you have been given the bad news that you need a home house rewire in Leeds – Bradford – Wakefield – York & Harrogate then you will be searching the internet for quality electricians in Leeds – Bradford – Wakefield – York & Harrogate that can conduct an affordable quality home electrical rewire. You have come to the right place so here i will tell you what a quality home electrical rewire is and why we are different from the competition as Electricians In Leeds – Bradford – Wakefield – York & Harrogate that conduct quality electrical home rewires that stand us apart. First and foremost is knowing that a home electrical rewire in Leeds – Bradford – Wakefield – York & Harrogate is a messy job, why you ask ? A quality home electrical rewire involves looking after the customers home first and foremost as it will be filled with belongings that can get damaged when dust and dirt is created with the natural course of a home electrical rewire. We protect your belongings from start to finish by shrink wrapping furniture and floor coverings, we also leave power on every night as we know most of the time you have to live in the home during this process. Trust me moving furniture around every day, lifting carpets and floors up then floor boards and restoring them every is time consuming and puts several days on top of a home electrical rewire in Leeds – Bradford – Wakefield – York & Harrogate. This is a fact but also unavoidable for some customers that cannot move out due to having a family. We know this and this is why me and my team work with you to make the process during the rewire as comfortable as possible. This is where the quality of the company comes in because most will kill all the electrics and not take this into consideration as they rip out the old wiring while they replace it with new wiring. How is dust and dirt created during a electrical home rewire in Leeds – Bradford – Wakefield – York & Harrogate ? During the course of a home electrical rewire we have to chase out walls o a depth of at least 50mm into the wall to comply with electrical regulations namely the 17th edition electrical wiring regulations BS7671. This is for all cables in a home that are concealed inside the walls. We have to RCD protect the cables and this means the fuse box mounted and installed in the property conforms to the latest safety protection devices such as protection by a RCD RCD-61009. RCD Fuse boxes come in two types which we offer, install and supply in Leeds – Bradford – Wakefield – York & Harrogate and these come in two forms. 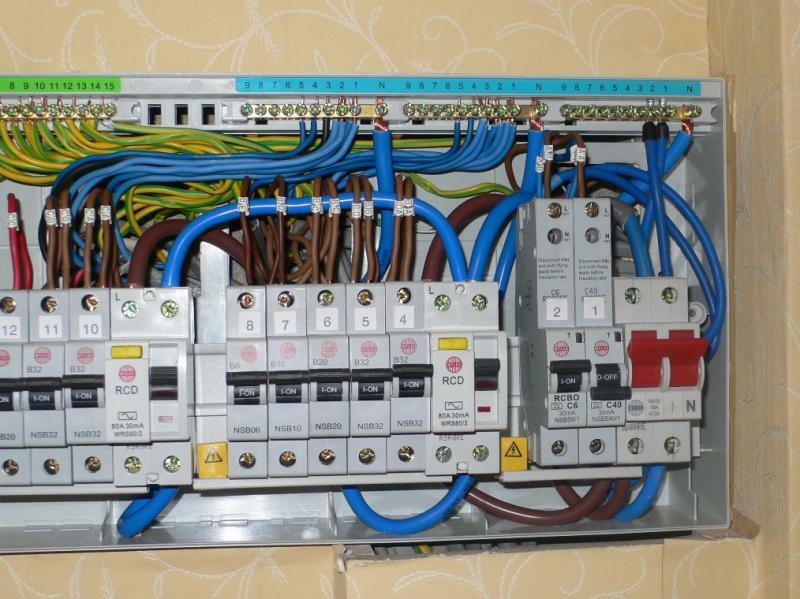 The first type of fuse box is a dual RCD fuse box, these are the budget type of fuse box because they incorporate two master RCD’S that control a bank of miniature circuit breakers, this means when the master RCD which is one of two operates under any fault conditions it isolates a complete bank of circuit breakers. The second type of fuse box is what we recommend is the RCBO fuse box, the difference with this fuse box is each circuit breaker has its own RCD built into it, therefore any fault within the property if it occurs stays limited to the one RCBo that activates under fault conditions. Now imagine you have a dual RCD fuse box installed and a fault occurs on any o the sub circuits one of the RCD masters (one of two) occurs, this means a complete bank of circuit breakers will be isolated plunging you into powerless darkness. The fault could be over any of the sub circuits installed leaving you clueless and having to fault find multiple circuits in order for the master RCD to reset, trust it will not until you have fixed the offending circuit involved and this can be costly and time consuming as instead of a electrician fault finding the one circuit in order to restore power to the master RCD which in turn restores power to multiple circuits the master RCD governs you have to work through each one fault finding to find the offending culprit. Now, with a RCBO board, if a fault develops, the one RCBO will trip off, so for example it says “Ground floor sockets” the electrician knows that something on the ground floor sockets is causing the issue so his/her time is limited to investigating that circuit instead of a complete bank of potential circuits affected. See what i mean in the difference in fuse boxes ?. Good read on. Now when it comes to a home electrical rewire in Leeds – Bradford – Wakefield – York & Harrogate you pay for the quality in the home electrical rewire such as the electrical components installed which you get installed during the rewire,trust me their is a difference between quotes, someone that quotes the cheapest in parts such as non decorative power sockets, light switches, electrical fixtures and cable and someone, someone who under quotes other quality electricians in Leeds – Bradford – Wakefield – York & Harrogate by covering up the areas you cannot see by not clipping cables to the 17th edition wiring regulations minimum standards will under cut any other electrician on price but give a sub standard electrical rewire all in all. All cables concealed underneath floors, above ceilings and enclosed in walls should be clipped and this takes time, antibody can catapult a wire in from A to B, put the floor boards back down and cover them up so the customer cannot see them and shave 5 days off the time and quote to conduct a electrical home rewire in Leeds – Bradford – Wakefield – York & Harrogate. The only saving grace is me telling you this now as i have been in this electrical industry for 24 years to date and i have seen all the tricks electricians use to undercut us and poach jobs from us by giving the customer a cheaper quote so guess what, here is the truth, please read on. A three bed semi rewire, a to standard quality home electrical rewire in Leeds – Bradford – Wakefield – York & Harrogate will take two of my electrician Monday to Friday the minimum ten days to complete with a days plaster patching and filling up to finishing standards for all the chases and holes we create in walls and ceilings, this is a fact, we do it day in, day out. If someone offers you a home electrical rewire in Leeds – Bradford – Wakefield – York & Harrogate for under this time then you the intelligent customer have to think of the following. Where are they saving the time ? Where are they saving on cost ? The answer is both! we install decorative quality branded power sockets, light fittings, switches and cable, the difference is we give all our installed equipment a ten year warranty because it is that good and do not use the cheapest materials in order to line our pockets. Get in touch today for a free quotation a electrical home rewire, many thanks for your time.